Galapagos Sky is a luxury Liveaboard that gives a superb opportunity of discovering marvelous diving destinations of Galapagos Islands. 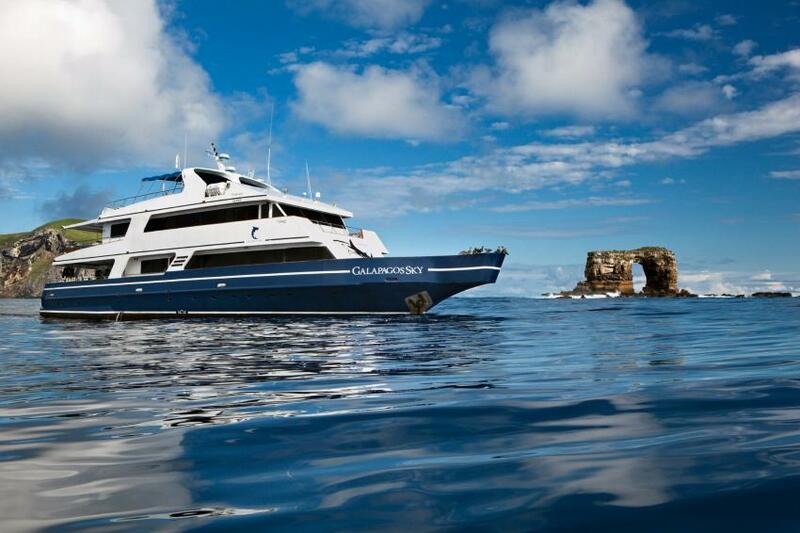 Galapagos Sky has a small capacity, she can comfortably accommodate 16 vacationers. Eight cabins are equipped with twin or king sized beds. All staterooms have a private shower and air conditioning. Boats salon is perfect to spend time in between dives and chat with other passengers on board. Meals are served in the spacious dining room. For those, who prefer to stay on the fresh air, this boat has a sun deck with sun loungers, that is perfect to enjoy the view. Dive deck of Galapagos Sky has enough of space for divers on board. It is comfortable for preparation to diving and to maintain diving gear after dives. Boats crew cares about safety on board. Galapagos Sky equipped with necessary facilities like first aid kit and life vests, boat team is trained to manage emergency situations. Galapagos Sky is a rather small boat,it can welcome only 16 passengers on board. Thanks to that passengers can get a personal care from the crew team. Two dive masters on board will make sure that you will see the breathtaking dive sites of Galapagos. Galapagos Sky itineraries include diving on the most attractive dive spots of Galapagos Islands, famous destination. Its water represented by a diversity of underwater creatures such as hammerhead sharks and eagle rays. Diver has a chance to see marine iguanas, Galapagos sharks, turtles, golden rays and whale sharks. It is hard to fins other destination with such a variety of species. Sea lions and penguins can be met here. Some rare fishes are a regular guest of Galapagos Islands. Diving with mola mola and red-lipped batfish males this destination truly amazing. There are two major seasons for diving on Galapagos. Dry season сontinue from July to December. Average water temperature is about 19-23°C. It's a superb time to dive with sharks. January to June is considered as a wet season. Temperatures are higher during these months. My husband and I had a great experience on board Galapagos Sky in November 2018. We stayed in a master cabin (upper deck) which was very comfortable with large picture windows and a nice size private bath. There was a good variety of food and plenty of snacks available. All the staff were great, but I'll mention the dive guides in particular (Max and Quiko) who worked extra hard to maintain a safe environment and ensure we had the experience of a lifetime.